Vietnam veteran ponders the sordid result of youthful patriotic fervor at The Wall in Washington, D.C.
As official United States forges ahead with its controversial 13-year Commemoration of the 50th anniversary of the Vietnam War, which, incredibly, extends from May 28, 2012 to November 11, 2025, and the world celebrates the 40th anniversary of the end of the American War in Vietnam this month, here’s a simple exercise that will help you comprehend the horrific magnitude of the loss of human and, more specifically, Vietnamese life during that war. 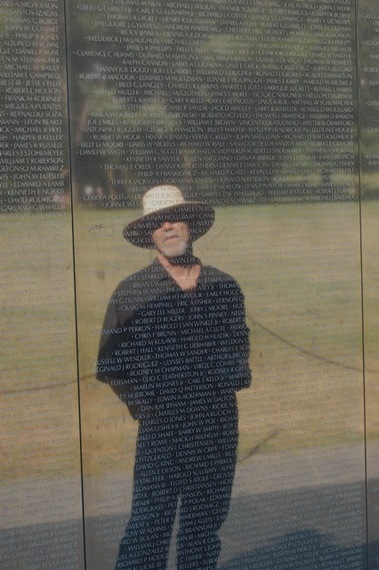 The next time you’re standing at the Vietnam Veterans Memorial in Washington, D.C. thinking about the 58,000+ Americans who died in what was essentially a war of national liberation, perhaps including friends or family members, reach out, touch the black granite, close your eyes and multiply The Wall by 65. Let’s call it the Vietnamese Monument, the Ultimate Wall, inscribed with the names of 3.8 million mothers and fathers, sons and daughters, grandmothers and grandfathers, nearly 9 percent of the population at the time, including 2 million civilians, who were murdered by the U.S. military, its client state and various allies, e.g. Australia and South Korea. Follow this link to read the rest of this essay on The Huffington Post. ← Happy Liberation & Reunification Day, Vietnam! Chào mừng kỷ niệm 40 năm ngày giải phóng miền Nam, thống nhất đất nước!